AdoptOpenJDK comes in two flavours – one with the usual HotSpot JVM and one with OpenJ9. After completing the first round of executions I decided to also add Graal. Unfortunately I could only find builds based on OpenJDK 8, but the Graal JVM is the latest possible built just a couple of days ago. Which is faster? Most likely the answer to that depends on what you’re testing. I decided to test matrix multiplication, and to test that using 3 commonly used pure Java linear algebra libraries. The test performs matrix-matrix multiplication on square dense matrices of various sizes: 100, 150, 200, 350, 500, 750 and 1000. The libraries have made different choices on how to store the elements and how to implement multiplication. In particular ojAlgo is multithreaded, and the others are not. The goal here is not to determine which library is the fastest, but rather to get an idea about what happens when you change the JVM. The chart below shows the speed (throughput, ops/min) for the various library/JVM combinations for each of the different matrix sizes. 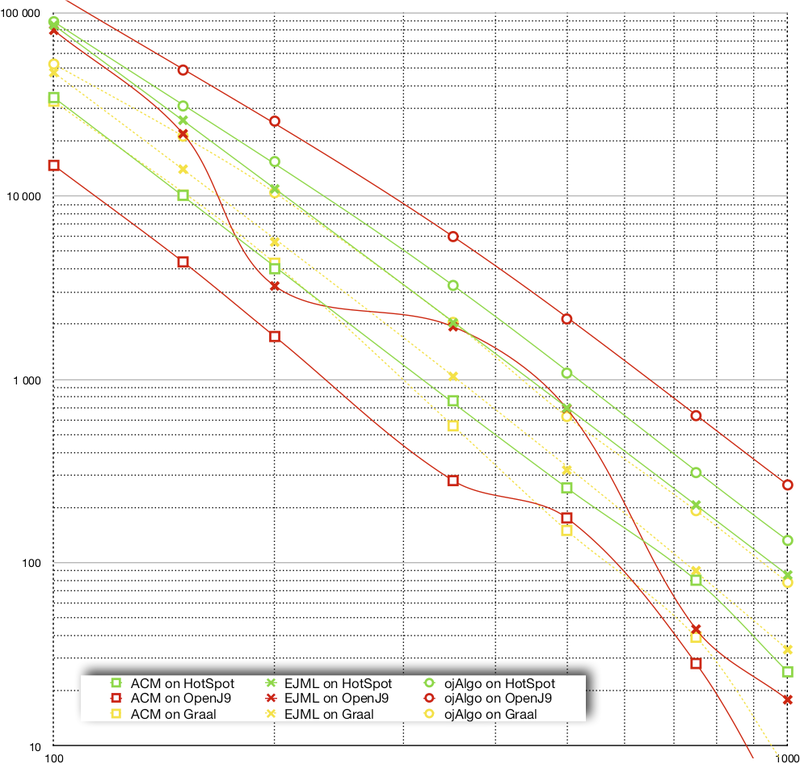 OpenJ9: Switching from HotSpot to OpenJ9 makes ojAlgo faster, ACM slower and EJML fluctuates between roughly the same performance and much slower. It seems OpenJ9 is less stable in its results than HotSpot. Apart from the fluctuations with EJML it widens the gap between the slowest and the fastest code. OpenJ9 makes the fast even faster and the slow even slower. Graal: Graal was consistently slower than HotSpot (half speed). This is the community edition (CE) of Graal. I’ve learned that (full) support for vectorization will only be in the enterprise edition (EE). I’m guessing that the EE will give performance similar to that of HotSpot. The speed differences shown here are significant! Regardless of library and matrix size, performance could be halved or doubled by choosing another JVM. Looking at combinations of libraries and JVM:s there is an order of magnitude in throughput to be gained by choosing the right combination. This will not translate to an entire system/application being this much slower or faster – matrix multiplication is most likely not the only thing it does. But, perhaps you should test how whatever you’re working on performs with a different JVM. This test was executed on a Google Cloud Platform Compute Engine: n1-highmem-4 (4 vCPUs Intel Skylake Xeon, 26 GB memory).